This was the trip that was originally planned for Christmas and New Year, leaving Perth on Boxing Day 2014. We postponed it until July, with the little ones’ passports proving a hold up that saw the cost of air fares getting out of hand. 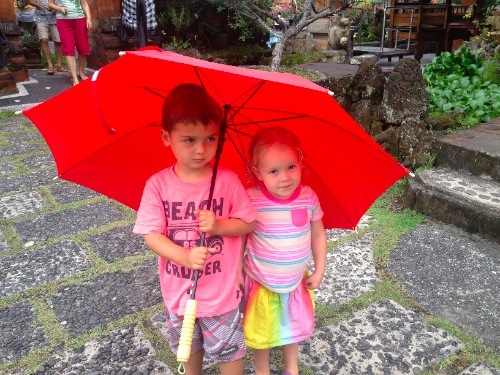 In the end, the delay proved beneficial, with the extra six months being good for all four kids, the older two getting more out of their first visit abroad and the younger two being up and about on two feet. The trip to the airport was complicated by heavy rain, making the juggling of cars and luggage between long term parking and Terminal 2 slightly harder than it should have been. Check-in went without a hitch and we thought we had the whole thing down pat until we hit immigration. Joy’s passport had been chewed in one corner, courtesy one of the little dogs. It had passed scrutiny on a previous trip to Singapore but failed the test this time. After some negotiations with the officials, they agreed not to phone DFAT, who, according to them, would order the passport confiscated, meaning that Joy could not go. We were all rather concerned but having agreed that the risk was Joy’s, they allowed her to take the offending document on the promise of having it replaced on her return. The worry was that Indonesia would also pick up on it and refuse entry. The wait in departure was short and the kids were kept amused by the many planes and trucks scooting around. We boarded without trouble and scored a bonus spare seat next to Christine, giving us a bit of flexibility with the kids’ seating. The flight itself was easier than we had thought it would be with no real issues, other than the terrible food. We had pre-ordered to ensure we got something reasonable but the meals were very poor and there appeared to be better fare available on the menu. 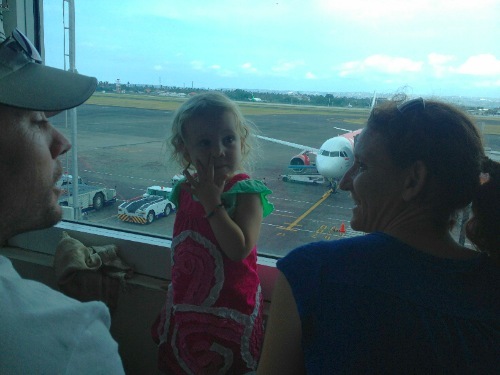 Once in Denpasar, we were very glad that we had arranged a VIP service to meet us and process us through immigration. 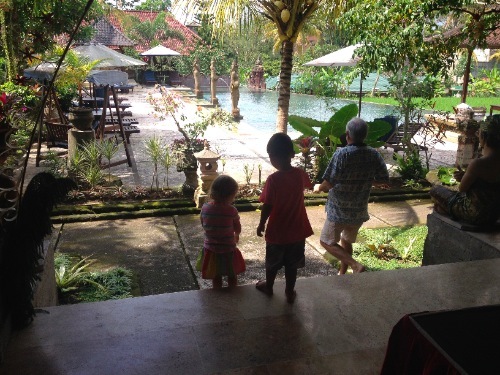 This service gets mixed review on the internet, with many claiming it is a waste of money and unnecessary but with four children and loads of luggage, we found it wonderful and worth the money. We were greeted, our passports collected, along with the Visa on Arrival payment. After a quick check to confirm our pictures matched faces, we walked through immigration and collected baggage before the rest of the crowd arrived. By the time we reached our hired mini bus, the passports were processed and returned. So easy. 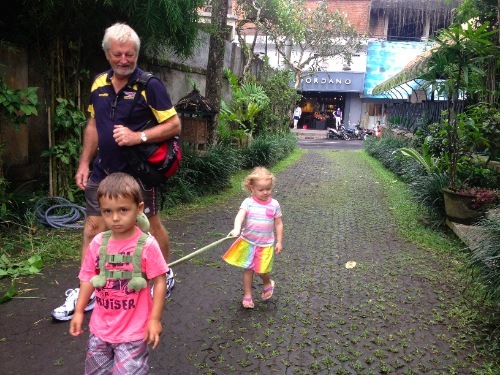 It was dark by the time we arrived in Ubud and the kids showing signs of unravelling. We threw everything into our four rooms and hit the restaurant for dinner. This was a signal for the kids to either start crying or behaving like animals, depending on their level of sleep deprivation. Still, we had arrived and there was cold beer in abundance so all was not lost. 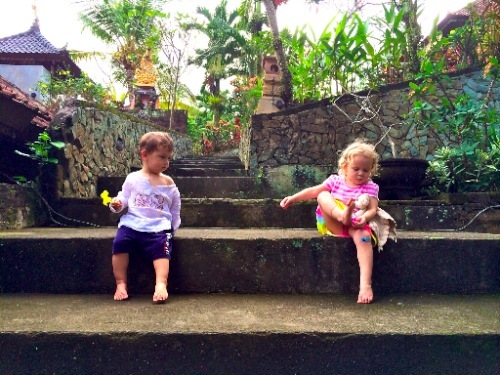 We stayed at the Cendana Resort and Spa in Monkey Forest Rd, Ubud. It proved to be an excellent choice for this holiday, with four specially selected ground floor adjoining rooms with good sized balconies and a lovely grassed area out front. Each room had two queen sized beds and cots were supplied for the youngest two. 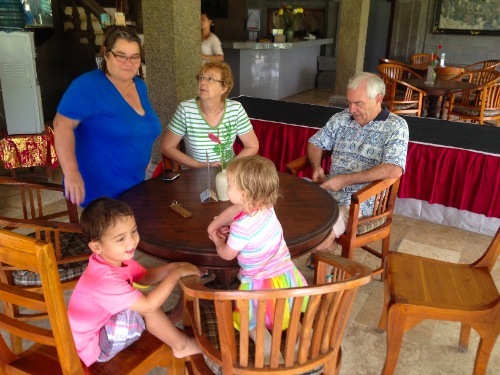 The restaurant was basic but cheap and the two pools, one salt and one fresh, proved a hit with all four kids. 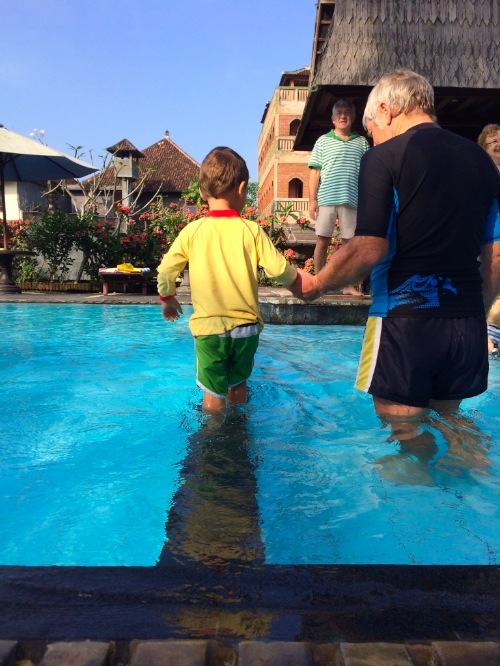 There were plenty of places to explore and walk with the children, visiting the birds (hill mynahs with amazing mimicry), the koi carp pool or the “magic steps” down to the spa area. 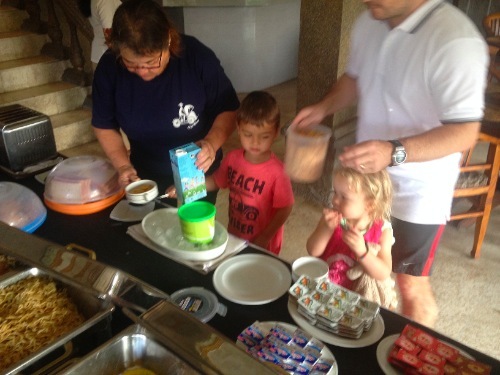 After a couple of meal times punctuated with crying, screaming or temper tantrums, the children settled into a routine and finding a restaurant for a family meal became a pleasure. Christine had found an excellent baby gear hire service and had two high chairs and a pusher delivered to make life easy. We got a few amused looks from other tourists as we trooped down Monkey Forest Rd carrying the two bright green high chairs in search of a good eatery. We had very few duds, with most places serving up a standard that at least is acceptable. 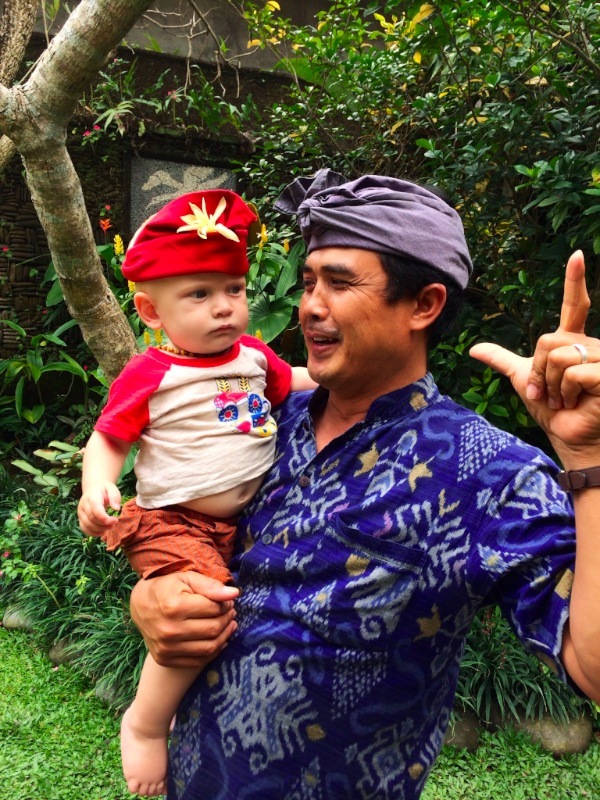 One place that impressed everyone was the Cafe Wayan and Bakery. It fully deserves its 4.5 Star rating on Trip Advisor, with ambience plus, excellent food and wonderful staff. We organised a “birthday” lunch for Christine, seeing as we will be away from the family on her 60th at the end of the month. The restaurant turned on the charm in a big way, organising an amazing cake, which was presented by a procession of singing staff. One waiter was a “child whisperer”, proving his skills by picking up both Kelsie and Ashton without causing the usual screaming fit. He really had the knack, creating origami mice out of table napkins and cranes out of brochures. All this and a menu to die for, with the Nasi Campur declared the pick of the dishes, although the crispy duck challenged it for top spot. Another interesting meal was at a small place opposite the entrance to Cendana. We wandered down a lane to find an outdoor establishment that looked as though it was closed for the night. A lone attendant assured us that they were open so we set up the high chairs and settled in to choose from the menu. Of course, beers were ordered first, then a variety of dishes from the reasonably varied selection. The lone guy hurried away and soon there was a bit of banging and crashing from the kitchen. Then, he was seen scurrying away into the night, to return with some beer, probably from a nearby 7 Eleven. The wait continued and we had to find some ways to amuse the kids, who were showing signs of having a turn. There was more banging and crashing until eventually, nearly an hour after ordering, the lone man emerged to serve up. He was the maitre d’, the barman, the waiter, chef and the cashier all in one. Fortunately, he was good at his jobs and the food was wonderful and cheap. We left a good tip so he was rewarded for his efforts. 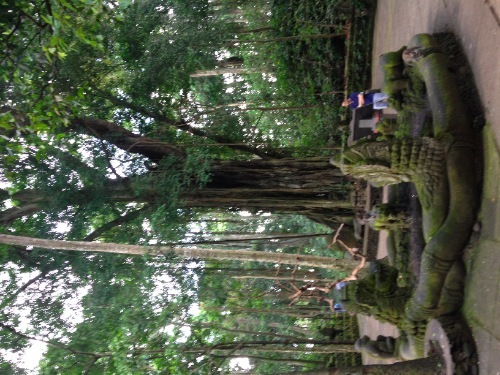 A trip to the Monkey Forest was fun. This is a place that is probably best avoided, but with care, can provide a fun excursion. 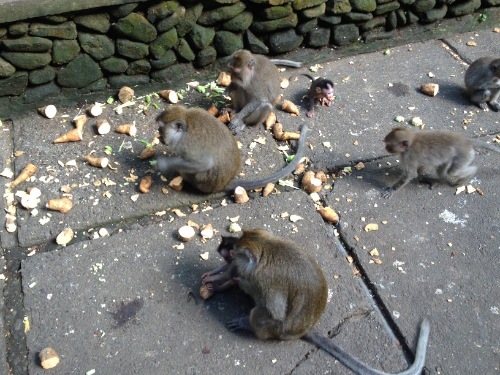 The monkeys, Balinese Long tailed Macaques, are everywhere and always looking for an easy feed. Buying a bunch of bananas at the entrance absolutely ensures that the monkeys will pay you full attention. Apparently, they also love spring water. We watched one young Japanese girl being attacked by two small monkeys, climbing all over her until she surrendered the bottle. Her friends filmed the incident so she could enjoy it later. One friend came undone when a monkey took a liking to his awful woven hat with bright blue trimmings and climbed up to get it, along with his glasses. The girl who had been attacked earlier got her revenge by filming the attack on her friend with the ugly hat. We just kept our hands to ourselves, hid everything of interest and kept a careful watch on the children. As always happens, by the time came to leave, the kids had settled into routines and life was pretty sweet. Breakfasts ran like clockwork, the day was a regimen of swimming, walking, shopping and dining. We even managed a few night get togethers after the children were bedded down. We absolutely loved our trip. It was a wonderful opportunity to catch up with the family experiences that we miss by being away so much. Ben and Kelsie got so much out of the experience, gaining in confidence and questioning everything. Lucas and Ashton, the two babes, had a ball, with so many people around to give them plenty of attention. Mind you, none of us could compete with Mum. 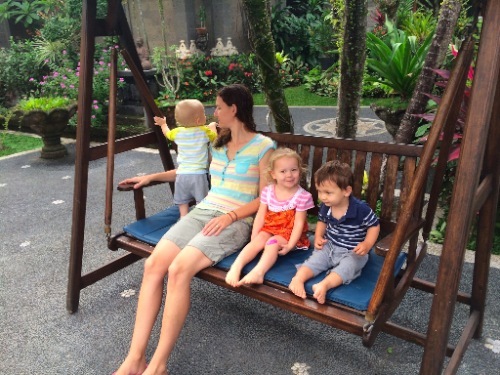 Hopefully, the kids managed a degree of relaxation, something that is so very hard with a couple of small kids. Joy and Trevor both suffered from slow curing flus carried with them from Australia but, amazingly, none of our group of twelve suffered from the dreaded Bali Belly. Christine and I also really enjoyed the opportunity to spend some quality time with John and Alison, the other parents, something we always promise to do but so often miss out on. As parents of this whole brood, we can be truly proud. iPads keep the little ones quiet. Once home, we wasted little time in getting up to Dowerin to ready the house for hosting exhibitors at the Dowerin Field Days (27-28 August). Then its fly back to Sydney to pick up Sandpiper and resume our travels northwards, hopefully to find some warmth. And proud you should be Terry and Christine…How lucky you are to have such a wonderful family that enjoys spending time together. To me, that means you have done the job that you have been put on this great earth to do. And done it well. 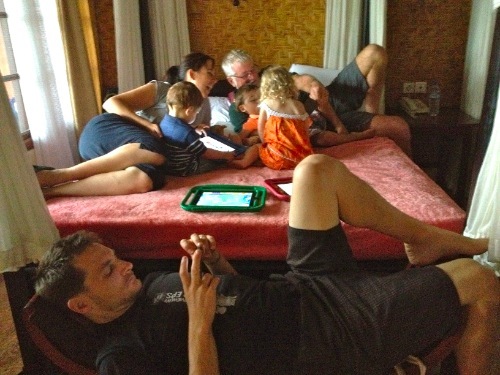 As parents, educators and human beings…I applaud you…….Gosh, got a bit deep and meaningful for a minute…As always I love reading about your travels…Keep them coming…Follow that sun and have fun! !